The third narrative film from rising filmmaker Ava DuVernay – whose previous story-driven films I Will Follow and Middle of Nowhere have earned her wide praise despite their limited audience reach – is both a powerful retelling of a horrific time in the latter half of the 20th century and also a truthful commentary on racial relations today, especially in light of last year’s Ferguson protests across the US. A case of unfortunate timing has caused many to draw parallels to those recent events and those depicted in Selma, and taking into account how this film goes to uncomfortable detail in showing how poorly African-Americans were being treated in the Southern states, it is easy to see why. As the first major film to be released not just about the incidents in Selma, Alabama including what is now referred in the States as “Bloody Sunday” – wherein peaceful black marchers were savagely beaten by police officers on the first attempted march from Selma to Montgomery – but also with Dr. Martin Luther King Jr as a main protagonist, it is certainly hard-hitting stuff. David Oyelowo gets his long-deserved due as the famed activist, and he succeeds in inserting the warmth and humanity into the man while also the down-to-earth reality that keeps him from being wholly perfect. It’s quite alarming that a film primarily concerning such a historical figure has taken this long to even be released, let alone be made; and even then, the film shouldn’t be identified as a straightforward biopic of King since it focuses mainly on the incidents leading up to and around the Selma-Montgomery marches. It even takes place after his more famous contributions to history, such as the March on Washington in 1963 and consequently his “I Have A Dream” speech, and begins as King is receiving the Nobel Peace Prize for said speech. This allows us to be shown a version of events in history that not many people might be aware of, despite its common nickname of “Bloody Sunday”, and be drawn in to how it depicts such events to an unassuming crowd, with Oyelowo’s King leading the way. Much has also been made on the film’s apparent disregard for historical accuracy, in particular its depiction of then-President Lyndon Johnson (Tom Wilkinson). Several commentators have gone on record to dismiss the film’s suggestion that Johnson was reluctant to allow King and his fellow activists to travel to Selma and stage their protests while he focused on fixing poverty, claiming that the entire idea came from Johnson himself, with DuVernay herself going on Twitter to strongly argue against these claims. In addition, Johnson’s approval for FBI director J. Edgar Hoover (Dylan Baker) to perform regular surveillance and harassment on Kings’ family, including wife Coretta (Carmen Ejogo), has led to further criticism and accusation of unfair white opposition from the filmmakers. 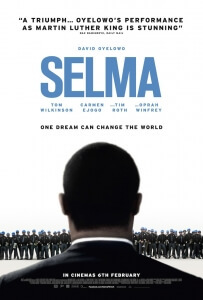 In our opinion, going in with a rough understanding of the criticisms some have with Selma’s historical inaccuracy has caused this reviewer to take it all with a pinch of salt, but it doesn’t undermine the overall impact this film can make on any viewer. Even if the truth is distorted slightly to appease dramatic tension, it’s still a captivating story that’s expertly made and performed. We have no idea about White House politics at that time, nor do we insist on offering a careful analysis of every decision that Johnson made while in office; we’re here to express our thoughts on the entire project as a movie, and as a movie it is very impressive. Selma is an important film that demands to be seen by those engaged in modern-day politics, presenting a heart-breaking parallel with the racial divisions of then and now, and thanks to Ava DuVernay’s focused direction and David Oyelowo’s domineering portrayal of Dr Martin Luther King Jr it presents a powerful story of the overcoming of prejudice in the harshest corners of 20th century America.